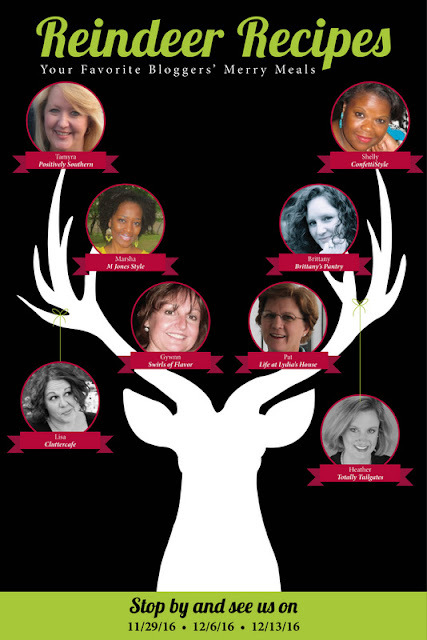 I'm so glad you are back to day for our second installment of Reindeer Recipes! If you've popped over from Totally Tailgates , I'm extra happy you are here! One of my all time favorite things to share on the blog are my tablescapes. In this busy world we live in I hear from many friends that they catch dinner on the run. Often times even our family eats in shifts due to all the crazy schedules we keep. When we do all make the effort to sit down for a meal together I do my very best to make it special and meaningful. Having boys I'm not sure if they even notice or care but I know I've done my part! 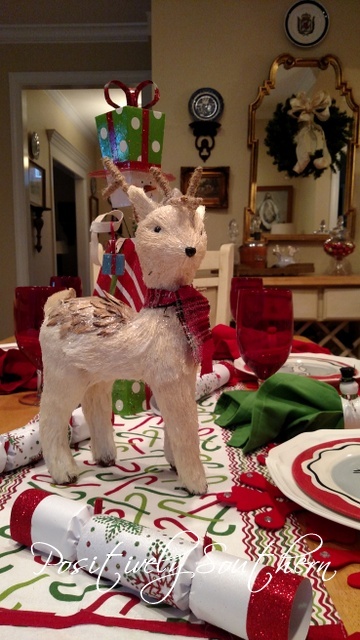 In honor of our Reindeer Recipes Tour, today I'm sharing my Snowman-Reindeer Tablescape. Since this tablescape will be set for a group of John's friends I made sure to scatter a few poppers to make it extra fun. I made sure to share a photo of the end of the table runner. Those snowmen are not to be missed! I almost hate to cover them with the plate. When I saw the snowman napkin rings I knew they would complete the look. Next Tuesday will wrap up our Reindeer Recipes Tour be sure and mark your calendar as you wouldn't dare wanna miss our New Year Eve Posts! Now....hop on over to my pal Shelly's at Confetti Style. I believe she has a post that is DELISH! 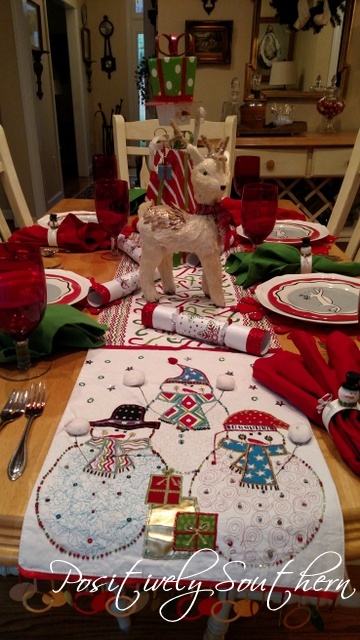 Tamyra, Frosty and his snow buddies look amazing on your tablescape. I totally love the runner and those boys will too! The poppers are a great touch and tip! Thanks love. What a bright and cheerful tablescape! I'm sure that your boys and their friends notice all of your effort even though they probably don't talk about it! Poppers have always been a big hit at our house. I'm sure the boys will love those too! 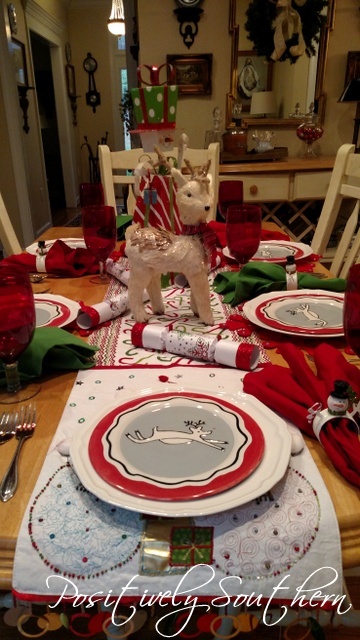 What a welcoming, festive tablescape! Your runner is adorable....and your glassware compliments everything so nicely. 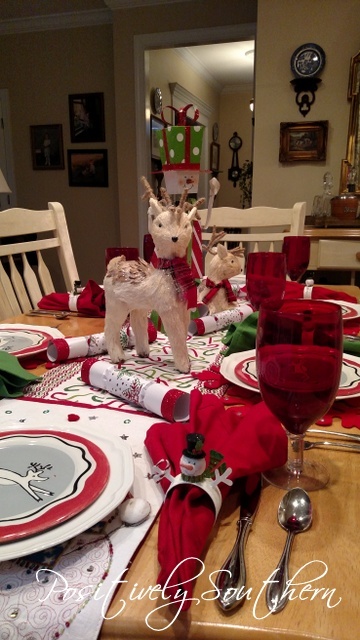 Love your cheery and festive tablescape Tamyra. It just puts a big smile on my face. Merry everything! What a cute table! And I like your snowman napkin rings too! Merry Christmas.